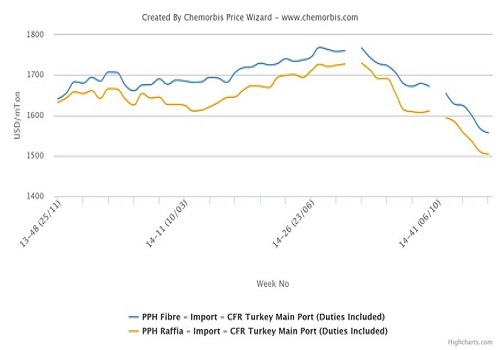 The PP market in Turkey touched the lowest level of the last couple of years following the relentless price decreases which have occurred since August as per the pricing service of ChemOrbis. The main drivers behind this decreasing trend were the bearish upstream costs owing to falling oil markets worldwide. According to ChemOrbis Price Index, import PP prices sank to the lowest levels of nearly two years. 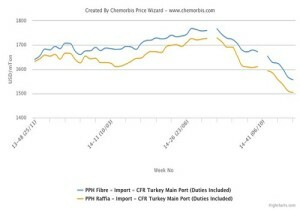 In the import market, PP raffia offers for a couple of Saudi Arabian origins broke below the $1400/ton threshold for CIF-based offers this week with players hearing deals at $1385/ton in line with buy ideas voiced by converters. “Offers for a Saudi Arabian origin declined around $75/ton week over week,” said a buyer. According to ChemOrbis, on another note, players are at odds about the state of prompt availability in the country. Some traders claim that overall prompt supplies are limited with respect to previous weeks as traders refrained from engaging in fresh cargos and preferred to make back to bask business. Buyers who want to meet their basic needs turned to prompt PP supplies which caused availability to dwindle, they argued. “Fibre supply is ample but raffia is limited in South Turkey. We received relatively more inquiries for prompt raffia this week,” said a trader. Another one who lowered their Middle Eastern fibre price from the bonded-warehouse by $50/ton stated that supply was limited in general. “We were able to find prompt cargoes in bonded warehouses,” a big bag producer noted though.